Post GDC 2016 reports emerged that Sony were working on the Playstation 4K and had shown off the hardware to developers, promising them considerably greater performance. This extra power is supposedly to allow the PS4k to render at UHD resolutions and push extra pixels and frame rate for Sony’s upcoming PSVR headset (which is released later this year). Since this original report popped up, additional sources have been verified and added to the ones over at Kotaku. But the reality seems to be all the stranger – during our own report on the original rumors, I had pointed out the massive increase in performance to natively render games at a 4K resolution. 4k is 4x the number of pixels of 1080P, which is a pretty tall for GPU performance. For reference, the PS4’s GPU puts out 1.84TFLOPS of performance, meaning the GPU inside the Playstation 4K would have to put out about 7.5 TFLOPS to achieve the same frame rates while contending with the pixels per second increase of 4K. Assuming the PS4k is released for early next year, 14nm FinFet GPUs and APU’s will have entered mass production, and its presumable Sony will stick with AMD as their supplier (it makes no sense for them to switch architectures half way through a generation). 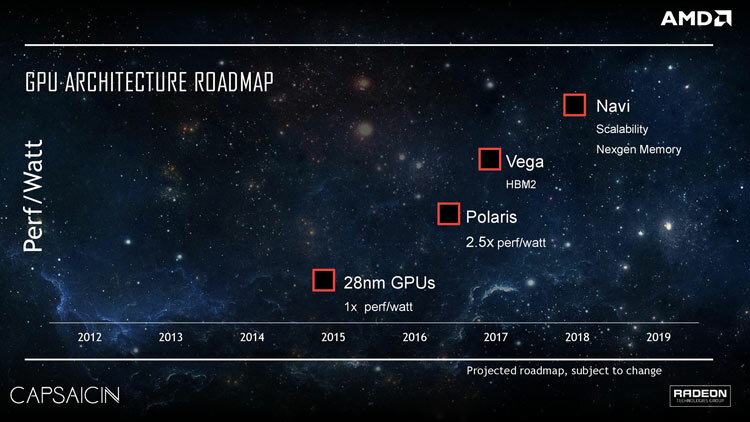 Following this logic, Sony could opt to pursue AMD’s Polaris architecture, which offers 2.5x performance per watt over the generation GCN hardware. But, even if this is the case, the PS4’s entire system requires just under 140watts of power, and despite AMD’s pledge to improve “Performance Per Dollar” during the companies Capsacian event during GDC 2016 and bring down the cost of VR (with lower cost GPU’s capable of powering VR hardware) it’s unlikely we’ll see prices reduce that much to squeeze almost 8TFLOPS of GPU performance into a console that’s worth sub $400. 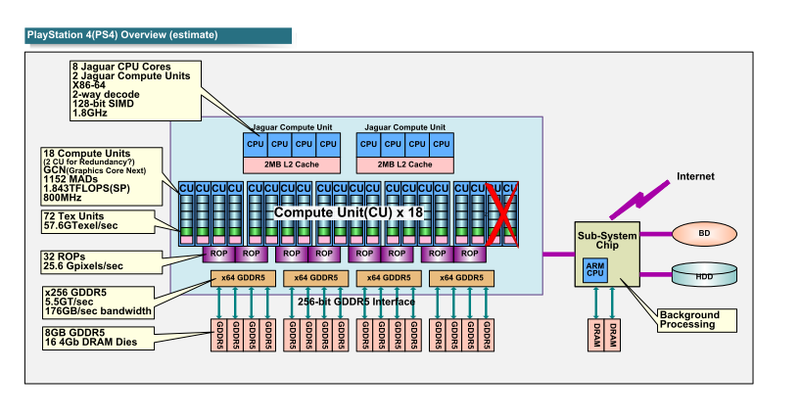 A CPU boost could happen – either higher clock speeds or a different architecture entirely. Considering the Xbox One’s Jaguar cores run at 1.75 GHz (compared to the PS4’s 1.6GHz) there is certainly room in the tank for additional clock speed. The maximum clock the Jaguar can support is 2GHz, but this the yields of the CPUs capable of this clock would be much lower. Exploring a different architecture, AMD’s Zen lineup of APU’s is on progress for next year and will appear in the form of Raven Ridge. This year we will only see Excavator core based APU’s, and it remains unlikely we’ll see these chips sufficiently cheap enough while maintaining a low enough TDP to offer significant gains – after all, AMD’s Jaguar processor is designed for low power devices (such as tablets and notebooks). We can take away that if this is the case, simply ‘upping’ the GPU performance of the machine wouldn’t suffice, instead a bump in CPU performance would also be warranted… and what of the RAM? We can presume that the 176 GB/s of bandwidth of the PS4’s 8GB GDDR5 wouldn’t be sufficient, meaning Sony would likely be forced to jump to GDDR5X – which likely won’t raise costs too much but will only 8GB RAM be sufficient for such demands? Consider how much data textures, shadow maps and other assets would require at such a resolution. It is possible Sony could opt to use the touted HBM technology, but it’s extremely complex and costly compared to GDDR5 or GDDR5X, meaning it’s unlikely. If Sony did opt to use GDDR5X, they would enjoy the benefits of the chips offering twice the performance per win over traditional GDDR5 (14gbps vs 7) which means in turn the same bandwidth can be achieved with fewer chips. Sony can’t add a massive number of chips or an ultra wide bus (say 384 or 512-bit), and with GDDR5X consuming less power, it’s a win-win scenario for the company. Rumor has it both AMD and Nvidia will be using GDDR5X for their Polaris and Pascal (respectively) range of cards because of the release date of HBM2 will miss the debut of their GPUs. This means Sony’s decisions with the upgraded Playstation 4k (for lack of an official name) are a bit of a mystery – it’s pretty darn certain we can expect the console to support such standards as HDMI 2.0, HDCP 2.2 and wider color gamuts. 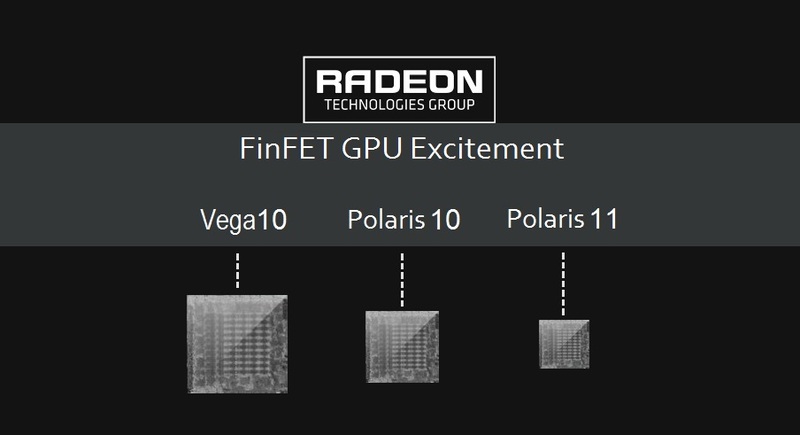 This functionality is part and parcel of Polaris (AMD have confirmed this several times over), and if Sony are going to be tweaking the PS4’s GPU to any significant degree, it makes sense they would use Polaris. 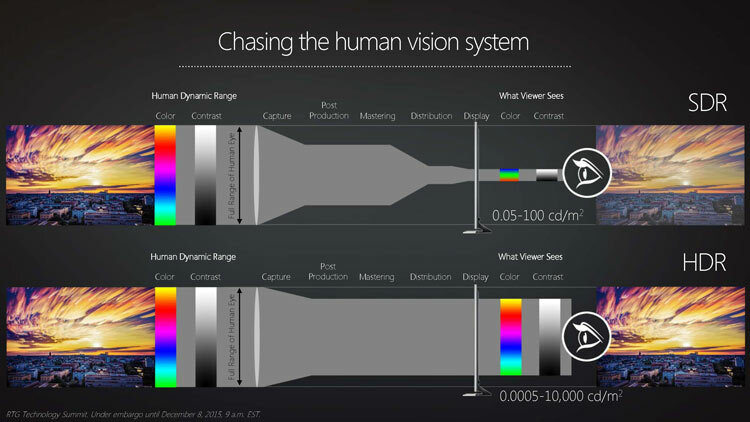 Interestingly, both AMD and Microsoft have spoken on the need for wider color gamuts and the general transition to HDR. During GDC at their DirectX 12 advancements conference, Microsoft believe the adoption rate of HDR capable displays will likely exceed that of 4K capable televisions because they believe that the difference in visuals to customers is “greater”. When the Playstation 4 was originally released, the unit cost Sony an estimated $381 US dollars to produce, just under $20 under the cost of the systems retail price. Since then Sony have managed to reduce the cost of the PS4’s reduction, and it’s probable that they’re considering working on a PS4 slimline (it follows the trend of their previous 3 consoles). So – what are Sony’s options when it comes to the upgraded Playstation 4k hardware? How much extra power are they likely and able to give developers, when you factor in technical and financial limitations? Assuming the Playstation 4 is released within the next 12 months, Sony will be able to take full advantage of the 14nm FinFet process. In this option, Sony would opt to provide a GPU which is between 1.5 to 2.5x the performance of the vanilla model PS4. This will allow the system to power games at resolutions above 1080P, or add additional effects to games. Assuming this is true, Sony would probably aim for the PS4.5 to cost roughly the same as the when the vanilla system launch (around the $400 mark). If this happens, a cost reduced vanilla PS4 (potentially slimline) will co-exist with it in the market as an entry level device. Sony could potentially leverage Zen (as explained above) or a bleeding edge clocked Jaguar clocked at ~2GHZ. A Jaguar clocked to at or near its limits would present a performance increase of about 20 – 25 percent, nothing to scoff at. There is also the outside possibility Sony could add additional Jaguar cores, but this is very unlikely – as it would add a lot of extra programming complexity to games by requiring developers to split up the tasks. None of this is to say that 4K games aren’t possible – but their visual complexity would be lacking compared to the AAA blockbusters of today. To put it another way, it requires a lot less GPU performance to render Quake 1 at 4K compared to Crysis 3. Therefore, realistically – we’ll see the machine capable of either 60fps in games the vanilla system can manage just 30fps, or better VR experiences, or higher resolutions and better visual quality. This would be the most striking difference, and visual quality would skyrocket. 4K streaming and multi media with NetFlix, Amazon and other applications, support for perhaps even VR media content and wider color gamut / HDR would all be supported too. We can presume that this will mean the Playstation 4K will offer considerably better visuals than the vanilla machine. For example, higher resolutions (say 1440P compared to vanilla 1080P), better shadows or lighting, better or more expensive Anti aliasing, better draw distances. For Playstation VR, it will also mean better visual quality in games, with more complex scenery. This is particularly important for VR because of the demands for high refresh rates and the need to push a low latency experience. Since we know the the Playstation VR won’t have any external processing for graphics; something has to give and on the regular PS4 it will be the graphical quality. A PS4K (or upgraded PS4) could potentially help level the playing field. 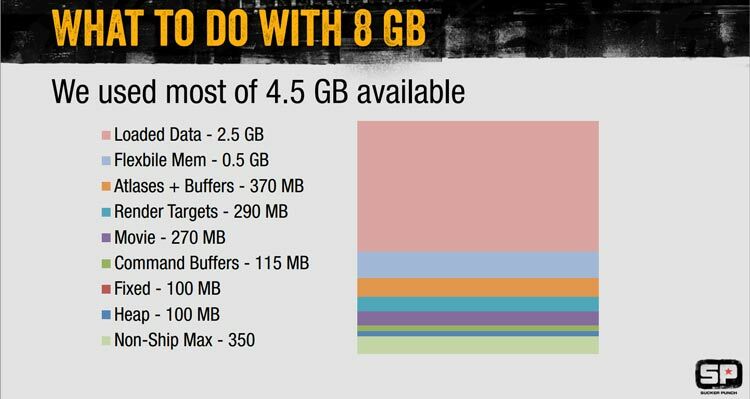 This is the more conservative of the two options, reducing the increases in performance further but leveraging the hardware that’s already existing. Sony could simply release a 14nm variant of the current APU, with a few additional Compute Units (the PS4 has 20 CU’s, but 2 are disabled for yields) or higher clock speeds. 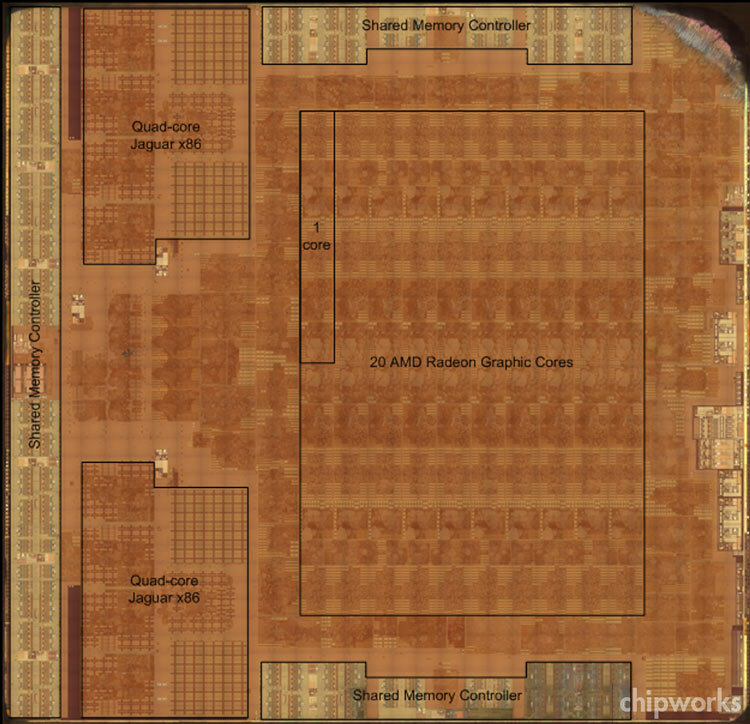 Conservatively speaking, it wouldn’t be too difficult to add 25 to 40 percent additional GPU performance with a few tweaks, and coupled with a slight clock tweak of the Jaguar cores, we could have enough. For example, a 20 CU enabled PS4 GPU running at 900MHZ puts out 2.3TFLOPS performance, compared to the 1.84 of the vanilla model. 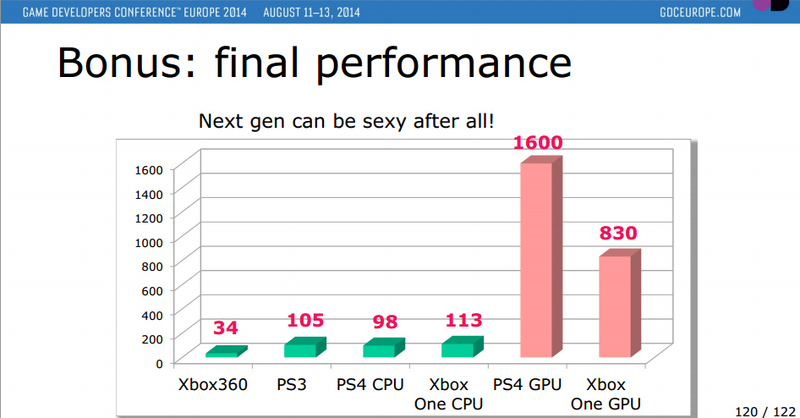 This is a similar enough gap (in performance) to the PS4 and Xbox One now (1.84 vs 1.32). If Sony also opt to switch to a new GCN iteration (such as Polaris or even the older Tonga architecture) they would enjoy better data compression too, which means that with only modest GPU performance increases, the current memory configuration (or perhaps switching to 6Ghz GDDR5, instead of the 5.5GHZ) will be ample to run the PS4K. This would mean that the hardware would still be capable of of improved multi-media, and games could certainly look better on the improved PS4 hardware, but they wouldn’t be considerably better. In terms of a gap, the difference from the vanilla to the improved model would be similar to the Xbox One and PS4 are now. Slightly more stable frame rates, maybe slightly higher resolution or nicer graphical effects. It goes without saying the additional 4K streaming and media functionality would likely be implemented, and potentially HDR support too. It would be a good way for Sony to separate the machines. Costing for this Playstation 4 model would be interesting, as it would be cheaper to produce than the system listed above – but would likely be quite a bit less powerful. Should Sony release a Playstation 4K? The benefit of a games console is fixed spec, but let’s be honest – hardware upgrades have happened in the past. The SNES and its FX chip, the Genesis and the Sega CD, 32X or the Sega Virtua Processor (SVP). The Saturn at the RAM cart upgrade, the N64 and its RAM upgrade… and that’s without trying to name systems. It improves the visuals and increases the complexity of what you can achieve with the same hardware iteration. But – now we’ve examined the evidence – it must be asked – let’s assume for a PS4 that’s twice the performance to the one we’ve currently available on store shelves. Is that enough of a jump for you as a customer to cough up? And what would it take for you to upgrade? Assume you’re unable to play PS4K games on a vanilla system, or at least certain titles – what you feel compelled to upgrade then? Nintendo’s New 3DS offers more powerful hardware (better processor for example), but precious few exclusive games… how many folks will upgrade just to play Xenoblade? An upgraded piece of hardware might fracture the PS4’s ecosystem – unless we simply see games appear on both systems and only a visual update separates them. But if the future of console games is an updated iteration every 3 or so years, will that put folks off and they simply jump to PC? Sure, hardware costs are greater – particularly the initial outlay, but backwards compatibility is virtually limitless; and games will look better on a higher spec PC than a Playstation 4K, PS4.5 or whatever it ends up being called would ever be capable of. So, perhaps this PS4 will be designed for the PSVR – and drive improved visual quality to those games. This is certainly a distinct possibility – but then with PSVR already $400 by itself, how many will gladly fork over to an upgraded Playstation? I suspect the answer will lie in the games… but just because you build it, doesn’t mean they will come. Xbox head Phil Spencer teased Microsoft were considering similar for its own games system, but then somewhat backtracked. Perhaps they will consider an upgradable console in the future – with a slot you can ‘plug’ a better GPU into (for example). But right now, it’s clear Microsoft are happy to let the Xbox One be an entry level Windows 10 gaming machine, while power users or those with disposable income or demand the best can game on a Windows 10 based PC. This demonstrates the fundemental difference between Sony and Microsoft – Microsoft simply do not necessarily care if you use the Xbox One to buy Quantum Break – they’re happy to take your money on the PC too. Sony don’t have this luxury, and must sell you Uncharted 4 on the PS4 – or they can’t sell you Uncharted 4. From the point of view of developers, it also will be interesting if they will offer “patches” for their existing games. Imagine a scenario where Naughty Dog provides a (free) patch for Uncharted 4 which improves the resolution or frame rate of other visual quality in the game. But then in a closed system – how will multiplayer work? Imagine you’re playing against someone in CoD who has a higher resolution display, or better frame rates – or potentially a better draw distance. It raises rather interesting question on how the upgraded Playstation 4K could interact in a multiplayer environment. Lastly – will games across both systems be ‘difficult’ to optimize? The PS4 uses a low level API known as GNM which means the hardware is fully optimized – will developers need to spend additional time tweaking to ensure there aren’t glitches, hitches or other problems across two platforms? This is even more true when you factor in older PS4 titles running on newer hardware, when these titles were designed for the old hardware in mind. 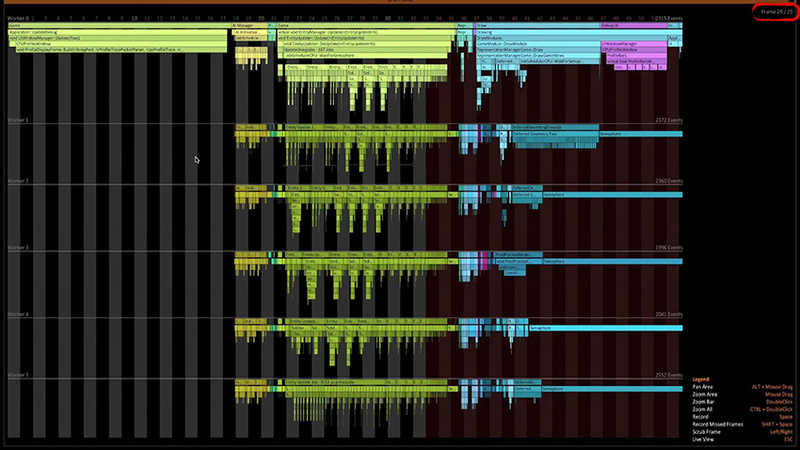 A certain number of shaders, a certain RAM speed… it leads to interesting scenarios. I imagine in most cases ‘timings’ will have been built in to the engines, and not reliant on GPU cycles to time frame rates, but there’s bound to some hitches somewhere, surely? And what if scenarios popped up which Sony couldn’t fix compatibility through a firmware update, but the developer either refuses to update the game which is broken, or can’t because they’ve gone out of business, or lost the rights to do this… think of Capcom’s license with Marvel as an example. Certain bugs were left in Marvel vs Capcom 3 because Capcom lost the license, and literally couldn’t update the game any further. If you only had the upgraded Playstation 4k, and not the vanilla (as you traded it in) you could be left with an unplayable game in the worst case situation. There’s few who’d deny the PS4 is in an excellent position in terms of sales, with Sony very much dominating the market. But if there’s one thing which you shouldn’t get in technology is complacent, and with reports showing the NX as being a pretty darn technically competent machine, and with images and leaks of the systems controller already floating about, Sony need to be careful or risk driving their customers into the waiting arms of Nintendo… which would be rather ironic since the situation was very much in the reverse in the PS1 vs N64 days. Tagged with gaming, hardware, navi, playstation 4, playstation 4 upgrade, polaris, ps4k, upgrade, vega.